I got to the office quite early today. This morning I felt so different from the other morning maybe because my system considers that today is a special day. And today is my hubby's birthday. And..I don't feel any happier instead I really feeling gloomy starting when the clock ticks 00:00. We have been together for 10 years. For the record, we never been able to celebrate any birthdays together. I am okay for the past 9 years cz I don't want to exaggerate the term couple tu kan..
And yet, it is still impossible for me to be by urside or the other way. Still impossible for this small things to happen. I am so sad for the whole day yesterday hoping for miracle to happen. Probably a broomstick fetching me and send me home to him or at least, there's free shinkansen ride yesterday. My birthday is coming too. I was thinking of a present for him. Like every year, I end up at a dead end. FYI, I never got him a nice, dreamed of present.haha..
No, not gadget. He has almost everything already. 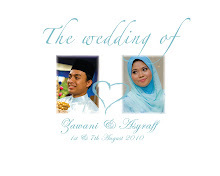 salam..:) ni first time saya komen blog ni even dah agak lama jugak saya link kan blog nie..
first of all, nak ucapkan tahniah sgt for both of u sebab sangat tabah n berjaya survive 10 years of LDR..saya doakan hubungan u dan dia kekal bahagia hingga akhir hayat..